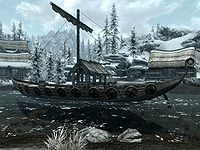 The Sea Squall is a ship docked in Dawnstar. The boat is docked at the end of a jetty opposite the entrance to Quicksilver mine. There are a collection of crates and barrels on deck along with three chairs that the captain and both sailors seem to spend most of their time sitting on.